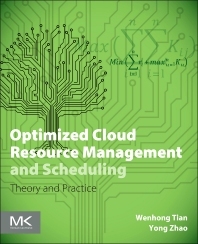 Optimized Cloud Resource Management and Scheduling identifies research directions and technologies that will facilitate efficient management and scheduling of computing resources in cloud data centers supporting scientific, industrial, business, and consumer applications. It serves as a valuable reference for systems architects, practitioners, developers, researchers and graduate level students. academic/research, graduate students, professionals, professional computer science developers and graduate students especially at Masters level. Dr. Wenhong Tian has a PhD from Computer Science Department of North Carolina State University(NCSU) and did post-doc with joint funding from Ork Ridge National Lab and NCSU. He is now an associate professor at University of Electronic Science and Technology of China. His research interests include modeling and performance analysis of communication networks, Cloud computing and bio-computing. He has published more than 40 journal /conference papers in related areas. Prof. Yong Zhao has a PhD from Computer Science Department of Chicago University (under supervising of Prof. Ian Foster); his is now a professor at University of Electronic Science and Technology of China. His research interests include Grid computing, large-data process in Cloud computing etc. He published about 30 journal and conference papers in related areas. In this Chapter, two existing simulation systems at application level for Cloud computing are studied, a new lightweight simulation system is proposed for dynamic resource scheduling in Cloud data centers, and results by using the proposed simulation system are analyzed and discussed. We are entering into a “big data” era. Due to bottlenecks such as poor scalability, difficulties in installation and maintenance, fault tolerance and low performance in traditional information technology framework, we need to leverage cloud computing techniques and solutions to deal with big data problems. Cloud computing and big data are complementary to each other and have inherent connection of dialectical unity. The breakthrough of big data technologies will not only resolve the aforementioned problems, but also promote the wide application of Cloud computing and the “Internet of Things” technologies. In this chapter, we focus on discussing the development and pivotal technologies of big data, providing a comprehensive description of big data from several perspectives, including the development of big data, the current data-burst situation, the relationship between big data and Cloud computing, and big data technologies. We also discuss related researches in the end.